There are more than 2,500 registered internet providers in the U.S. While the FCC says half the addresses in the U.S. have only one option for a fast internet provider, there are several commercial internet service providers (ISPs) with coverage in the Baltimore-Washington area alone. But how do you know which ISP is the best choice for your small businesses? Comcast Business is a subsidiary of the global telecommunications and broadcasting conglomerate, which offers special service lines for small and medium-sized businesses. Offerings are organized into packages, which can be searched by business size, industry, or service requirements. In addition to internet service, small businesses can save by purchasing internet and television services. Comcast Businesses’ network resources revealed they do have fiber internet services for business in the Baltimore-Washington Metro area. Headquartered in Little Rock, Arkansas, Windstream is a nationwide provider of data and voice services for both residential, SMB, and enterprise customers. The Windstream Small Business service line includes internet speeds up to 1 Gbps and flexibility in both phone and internet services. According to their website, their cheapest options for Kinetic internet service with speeds up to 25 Mbps starts at $59.99 a month when bundled with business phone service. This package may offer sufficient bandwidth for 1-4 users with very minimal data needs. Windstream currently offers some fiber connectivity service options in the Baltimore-Washington area. One of the world’s largest global telecommunications companies, Verizon is the Incumbent Local Exchange Carrier (ILEC) in the Baltimore-DC metro area and can provide dedicated business lines for small business. According to their website, Verizon small business customers get access to 99.99 percent network reliability, download speeds up to 940 Mbps, and no cap on internet usage. In addition to internet connectivity, customers may realize savings by bundling Verizon internet with phone, network solutions, or other service offerings. Verizon offers pricing for their small business internet packages online. For internet-only, pricing ranges from $84.99 per month for 75 Mbps (1-4 users) and tops out at $214.99 per month for a Fios Gigabit connection with speeds up to 940 Mbps. A nationwide telecommunications and connectivity provider headquartered in California, MegaPath’s closest office to the Baltimore-Washington metro area is located in Herndon, Virginia. They offer dedicated solutions for internet, phone, and cloud for small business. Savings on bundled services are available to MegaPath customers. MegaPath’s options for small business connectivity include Ethernet, T1, Fiber, Cable, Wireless, and DSL. According to their online resources, fiber-optic internet coverage for the Washington-Baltimore metro area is available, including speeds up to 10 Gbps. Some information on this ISPs pricing is available online--currently, Ethernet connectivity monthly costs range from $104-161. Founded in 1995, Atlantech Online has been the top choice for Baltimore-Washington small businesses for decades. Small business customers have access to a range of enterprise-class connectivity services at budget-friendly prices, including high-speed internet, fiber, business phones, data hosting, colocation, cloud connect, and more. Atlantech Online knows that great service is at the core of a positive relationship with your ISP. Customers have access to 24/7 live customer support which is never outsourced. When you call, a local expert answers and helps you immediately. With stable-proven technology, Atlantech internet for small business includes speeds ranging from 10 Mbps to 100 Gbps and reliability guarantees. Atlantech Online keeps costs for small businesses low without cutting the quality of service. We invest where it matters--on-staff experts, customer service, monitoring solutions, and technology. Then, we save where we can without harming customers, such as avoiding costly national marketing campaigns. Get a quote today. Atlantech offers both fiber-optic internet connectivity and on and off-net ethernet connections throughout the Washington-Baltimore metro area. To learn if your building is already wired for fiber, check your existing local access. Just click here and enter your address. How Do I Evaluate Baltimore-Washington ISPs for Small Business? Small businesses often face more challenges than a limited budget for business internet connectivity. Many times, business owners and IT managers are overwhelmed by trying to understand the key questions around what type of internet service they need. To help you read the reviews below with an informed mindset, we’ll answer a few SMB FAQ about business internet service. Here’s the short answer: if you’re not sure how much bandwidth is needed, a great provider should be able to tell you without a doubt. For organizations of any size, quality of service (QoS) ultimately depends on having enough bandwidth. The right bandwidth allocation depends on the number of users and usage type. Remember to check both download and upload (referred to as up/down) speeds with prospective providers; many providers offer fast downloads but fast up speeds sets the best ISPs apart. This is likely the most important thing, though. Not all business internet providers guarantee bandwidth to their commercial customers. Depending on your service provider, you may be guaranteed bandwidth and speed “up to” what you signed up for, and find your quality flags during peak periods of demand. What type of internet service do I need? DSL: Digital Subscriber Line, internet transmitted through your building’s copper telephone lines. Generally the slowest form of business internet. Cable: The most common form of “business high-speed internet,” this is internet transmitted over coax cabling technology. Fiber: The transmission of data using light through glass strands. Currently the most reliable and fast business internet option. Most surprisingly, fiber-optic internet connectivity is probably the long-term cheapest option for your business. Small businesses often know that switching to fiber offers business benefits, but rarely think it’s within budget. Not only is fiber much more affordable than you think, thanks to great fiber ring access in the Baltimore-DC area, your building may pay for installation. Dig deeper into the costs of fiber in How Much Does it Cost to Get Fiber Installed in My Building? What are Signs of a Great ISP? More insights can be found in 7 Things Companies Require From Their Business Internet Access Providers. 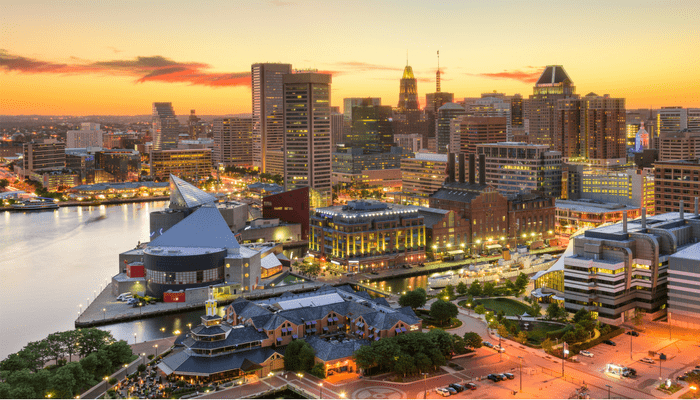 Who is the Best ISP for Small Businesses in Baltimore-Washington Metro? There are many options for small business internet connectivity for SMBs in Baltimore, DC, and the surrounding metro area. These include everything from locally owned-and-operated companies to multinational telecommunications corporations. Many small businesses are overwhelmed by factors like bandwidth and cost when it comes to internet shopping. While these are important details to consider, they’re not the only things you should take into account when reading reviews of your options. Do they offer local, expert customer service? Are they responsive when customers have problems? It’s the details that make the difference. 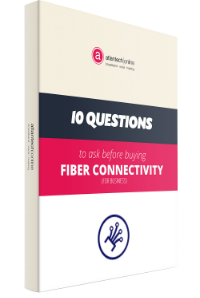 To educate yourself on how to identify the best-quality ISP for your business in Baltimore, DC Metro, or any other location, check out the free eBook: 10 Questions to Ask Before You Buy Fiber Internet for Your Business. Get all the information you need to make the smartest decision for your business’ connectivity.